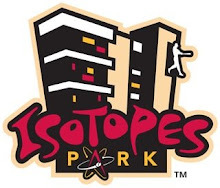 Players take center stage in the Isotopes new 'Topes Cinema. Welcome to the 'Topes Cinema blog! Check out your favorite Albuquerque Isotopes reenact scenes from various movies and see your beloved 'Topes in a different "Spot" Light! How Well Do You Know Dallas McPherson? Starring Dallas McPherson, John Gall, and Tag Bozied. Starring John Baker, Jason Wood, Tagg Bozied, Green Chile as himeslf, Red Chile as himself, Isotopes as confused-angry countrymen and a special guest appearance by Robert Andino as Flava Flav. Starring John Gall, Chris Barnwell, Tagg Bozied and Frankie De La Cruz. What movie would you like to see next on 'Topes Cinema?